EmunaDate, is a blog designed for Jews worldwide featuring; dating tips for singles, and articles that connect Jews to Judaism and Israel. This post is dedicated in memory of Etya Sarah bat Yitzchak ha-Levi. May it be an aliyah for her neshama. With Passover fast approaching, Moshe gets most of the credit when it comes to the story of the Jews leaving Egypt, but we wouldn't even be here today talking about the exodus if it wasn't for his older sister, Miriam. Her yahrzeit is next week, the 10th of Nissan. In her honor, let us look at the life of this amazing woman, and all that she did for the People of Israel. Miriam goes under another name in the story of the Jews in Egypt. There are many Torah commentators that say the character of Puah, one of the midwives that helps the Jewish women to deliver their babies and defy Pharoh's decree to kill all the boys, is actually Miriam. The letters in פוע also share the root of the word הופעה, to appear or stand up (to someone or something). Many times in her life, the Torah highlights times Miriam stood up to others - not only to Pharoh by ignoring his decree, but also to her own father when she told her father of the wrong he is doing by divorcing his wife. Her father didn't want to have a boy that would be killed by Pharoh's decree, so he decided not to have any more children. As a highly respected member of the community, most of the other men followed suit. Miriam chided her father, saying that he was enforcing Pharoh's decree on girls as well, by preventing them from even being born. Her father accepted her rebuke, and after he remarried his wife, they gave birth to Moshe, who would go on to free the Jewish people from their slavery. While traveling through the desert for 40 years, the Jews never had to worry about water, because the Well of Miriam brought water with them wherever they went. Wells are common throughout the Torah - with all of the Patriarchs digging them. And many couples get their start at the well (Eliezer notices Rivka, Yaakov meets Rachel). 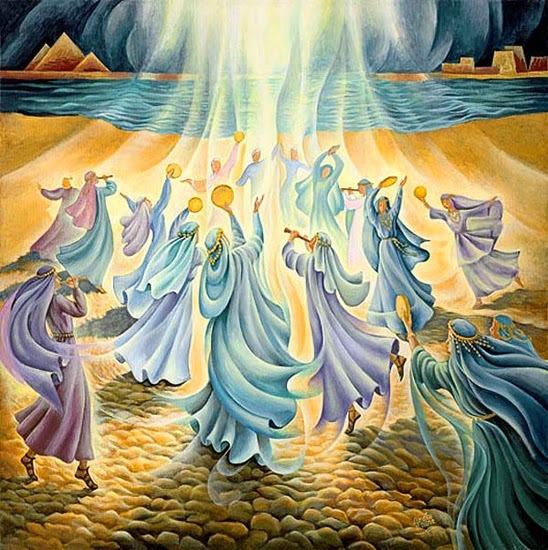 They also have a deeper, Kabbalistic significance - according to the famous Kabbalist - the Arizal, wells in this world correspond to wells of spirituality in the worlds above - and new wells also spiritual wealth to spill down into this world. Miriam brought spirituality into this world, not only through her clear belief in G-d, but she helped her fellow Jews actualize their spirituality by bringing them water - which is synonymous with Torah. Both are required for a Jew to live! According to the Gemara, the Well of Miriam resides somewhere in northern Israel, and can be seen from the top of Mt. Carmel (Tractate Shabbat 35a) although that is probably much of the north. There is another opinion that the well is actually within the Sea of Galilee (the Kinneret), which means it imbues all the drinking water in Israel that comes from the Kinneret, with its specialness. On top of all of this, Miriam was a prophetess, and due to her foresight, helped the women to prepare something special for the journey in the desert. Because Miriam knew that G-d would redeem the Jews, she and other women took the time to make instruments, so they would be able to have music while celebrating their freedom. This is the beginning of the Shirat HaYam, that is said every week on Shabbat. The song on its own is worth a deeper look, but it is also the first mention of a musician in the TaNakh. pirkei avot 3:11 - Don't Profane G-d's will. pirkei avot 2:13-14 - Why does a "Good Heart" trump all else? Pirkei Avot 2:6 - In a place where there are no men... be a man! Please visit here for my full Disclosure Policy. שבת שלום ! הגעת לאתר שומר שבת. בבקשה נא לא לגלוש באתר זה בשבתות וחגים. אנו נשמח אם תחזור לאתרנו במוצאי השבת. EmunaDate. Simple theme. Powered by Blogger.